When the Allen brothers founded Houston in 1836, they set aside small plots of lands to serve as the town's public grounds. Nearly two centuries later, that land — now called Market Square Park — continues its long-standing tradition of being a gathering place for Houstonians and visitors alike. The space occupies only a single square city block, yet packs in a ton of fun events, useful facilities, and beautiful greenery — all right downtown. Here's what you should know when planning a visit to Houston's Market Square Park. Way back when, John K. and Augustus C. Allen founded Houston with the idea that the city would be the heart of the great new Republic of Texas. They set aside some land in what is now Houston's downtown business district to build a grand national capitol — only to be disappointed when Austin took the permanent honor instead a few years later. Originally dubbed "Congress Square," the space became a bustling center for the city's emerging commerce, and was later renamed to "Market Square" not too long after its founding. A large building consisting of both a municipal market and city hall was built on the site, and residents and travelers gathered there to buy, sell, and trade all manner of goods, as well as conduct business with the city. Three fires and more than a century later, a 1960 blaze leveled the land to nothing but a parking lot for decades. A push was made in the late 1980s to renovate the space into a showcase of local artistry, but when the price of oil crashed, the lot — and much of the area around it — fell into disarray once again. Today's Market Square Park is the product of a revitalization effort undertaken by the city and area partners in 2010. Keeping an eye on history with a nod to the present, the new design incorporated bits of the location's history, along with modern functionality to return the plot to a bustling gathering place once again. View the Historic Clock Tower: This clock tower used to sit atop the city hall built on the grounds before the 1960 fire burned the building to the ground. Now, it stands as a tribute to the square's past life as a municipal hub and city center. Take the History Walk: Little pieces of the site's history are embedded along the curved walkway outside of the dog park, including remnants of demolished buildings that used to be on the square. Visit Lauren's Garden: This reverent garden near Congress Street is a touching tribute to the events of September 11, 2001, when Houstonian Lauren Catuzzi died with her fellow passengers aboard United Flight 93. 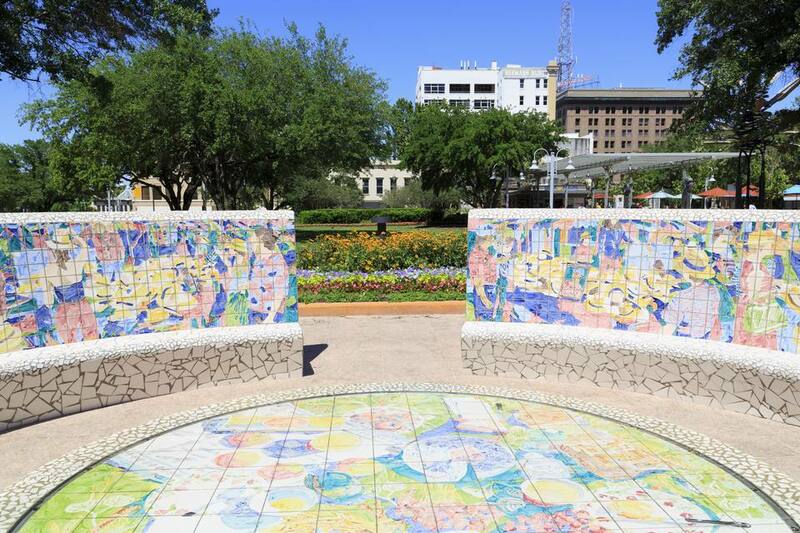 Check out the Mosaics: The park is full of beautiful art, but the most eye-catching is the mosaic fountain and surrounding benches along Preston Street that have become one of the site's most popular (and Instagramable) features. The park is home to many events throughout the year, including concerts, outdoor movies, BINGO, and fitness classes. It’s also a common meeting place for area clubs like some cycling organizations. Market Square Park isn't available for private bookings, but every once in a while, the site will house a big event to commemorate something big happening in the city, such as the Super Bowl. While there is no parking lot next to the park, the surrounding streets offer metered parking that is free after 6 p.m. and all day Sunday. If you'd rather not fight to find a parking space downtown, you can opt for one of the alternative transportation options nearby, including renting a bike. A BCycle station is just off of Congress Avenue on the northeastern edge of the park. Market Square Park is also located near the Houston's METRORail Red Line train a block from the Preston Station, as well as near several METRO bus stops, including the free GreenLink bus. When you're finished exploring Market Square Park, be sure to check out some of the other great attractions nearby, such as:. Houston’s Theater District is home to some of the city’s most beloved cultural institutions, including the Houston Symphony, Houston Ballet, Houston Grand Opera, Alley Theater, and Hobby Center. Only a handful of cities in the United States can boast permanent professional companies for all of the major performing arts areas — ballet, opera, music, and theater — and Houston is one of them. What's more, Houston's Grand Opera is the only opera company to ever win three Emmy awards, two Grammy awards, and a Tony. A few blocks away across the bayou, Houston's aquarium offers a wide variety of marine life, carnival games, and amusement park rides. Be sure to check out the shark tunnel, where visitors can take a train through a clear glass aquarium and view several different shark species from three sides. The big draw for the aquarium, however, isn't a water-based animal at all, but rare white tigers located near the end of the permanent exhibits. This 12-acre park — also located downtown — has a ton of great things to do for the whole family, including a dog park, playground, small lake, splash pad, amphitheater, reading rooms, and multiple interactive art installations. The rich assortment of amenities, combined with a jam-packed calendar of events, make it easily one of the best free places to go in Houston. Just a short walk away from Market Square Park sits a 130,000 square foot entertainment and event center that's a popular spot for date night, pre-show dinners, or a family night out on the town. The space houses a movie theater, concert venue, and several restaurants, as well as a large ballroom that frequently houses guest lectures and special events.